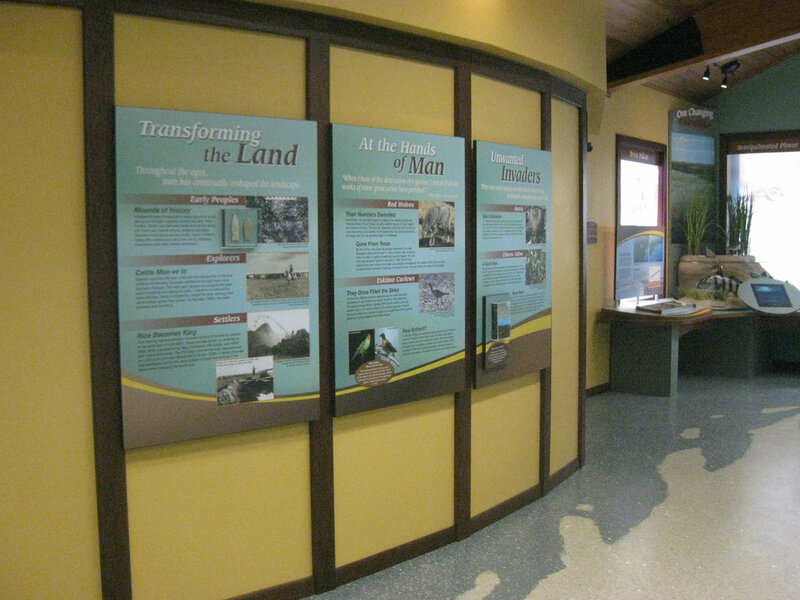 Wilderness Graphics designed, fabricated, and installed exhibits for a new visitor center at the Texas Chenier Plain National Wildlife Refuges Complex. State-of-the-art exhibits include a multimedia production, which takes visitors on airboat and helicopter rides through the four refuges in the Complex. The project incorporates a number of dioramas and photo frames as well as a soft-sculpture, walk-through alligator nest, complete with tactile objects and a backlit embryonic display. Bookstore fixtures that complement the interior exhibits were also designed and installed. Interpretive signs, mounted in decorative frames on natural rock bases, were designed, fabricated, and installed in a covered breezeway to offer after-hours visitors a glimpse of the Complex and its wide array of habitats and wildlife.